One cloudy day we found this lonely, awkward looking chair by the dumpster. I just saw the potential and the beauty this chair could bring to my home. We took it in and wondered what we had gotten ourselves into! 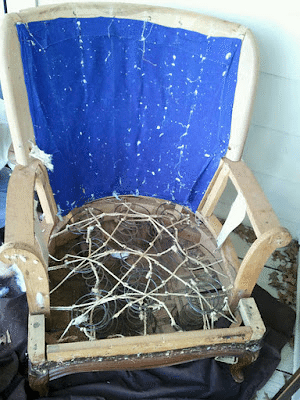 We knew nothing of reupholstering and we found more bad news as we when we removed the fabric! All of the foam was dusty and by just looking at it the chair made me itch. We decided to remove everything from the chair. All was left was the frame, nails and springs. Then the long journey to reupholstering began. It took about a month of long nights and hard work to finish the chair. I looked at other blogs and I could not find references to help with the process. 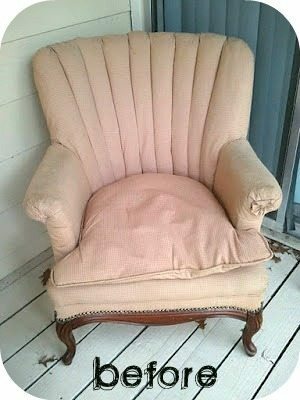 Most blogs only had the before and after pictures, so I decided to step by step tutorials for those who might need a little guidance in reupholstering. I go through step by step on how we attached the foam to the frame. You can see my hubby hard at work. When all was said and done here it how it looks like with the foam was stapled to the frame. 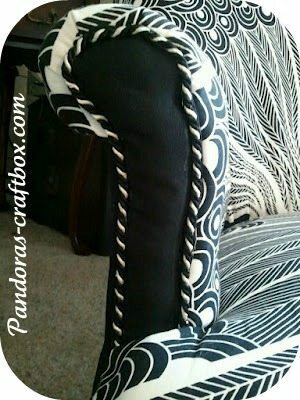 I think the easiest part of the chair was gluing the decorative trim to the chair. 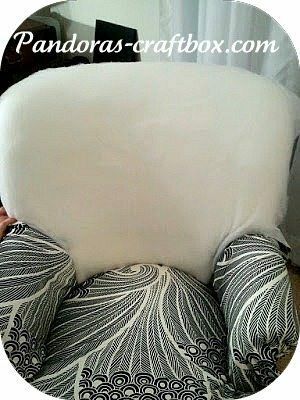 I hope you all enjoy reading about my journey with taking this chair from blah to glam. After this chair I don’t think there is anything I can’t do! I can’t wait to hear what you all have to say. That’s awesome work! 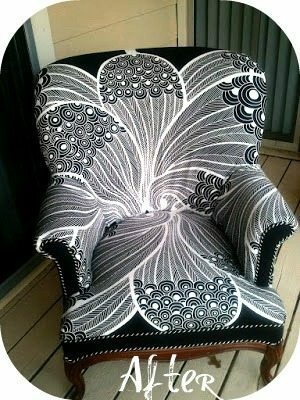 I think this has inspired me to go looking for a living room chair!! My thoughts exactly! Loren did an amazing job! Wow! Love the fabric choice! Yes, it’s not a boring neutral, yet it’s subtle enough to go with everything. It’s absolutely beautiful! Thanks for the tutorial. Absolutely gorgeous! Thank you so much for the tutorial! I’m very impressed. 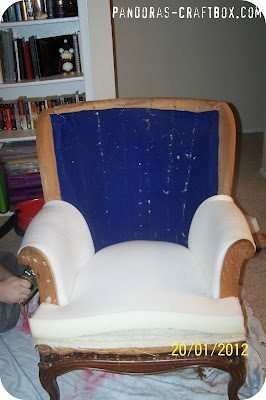 I have a much simpler chair to do, but this is great! How did you do the lines for the back? I couldn’t find a picture and I have 2 chairs just like that but I have no idea how. Loren…..you really nailed this one! A wonderful job and the fabric is just awesome! !! Can you add a link to the fabric? I’m in love!